There are numerous resources available for those who are interested in the history of the Back Bay. Before the 1820′s, Back Bay was quite literally a bay: a small saltwater bay on the shore of the Shawmut Peninsula and the Boston Neck, on which the City of Boston was built. By the 1800′s, the success of Boston’s shipping and manufacturing industries had led to intense overcrowding. Developers looked toward the Back Bay. 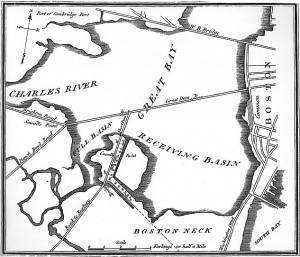 In the 1820′s, The Roxbury and Boston Mill Company built a dam, running across the Back Bay from the Public Garden to Brookline, to draw power for its mills. These companies also built railroad lines across the Back Bay, cutting off the basin’s ability to flush out debris and toxic waste from the City of Boston. In 1856, the Commonwealth of Massachusetts decided to fill in the Back Bay and to construct a new neighborhood on top of the wasteland. By using new steam engine technology, land was hauled in from Needham, 25 miles outside of Boston. After nearly 25 years of construction, the entire Back Bay was filled in, from the Public Garden to Kenmore Square. 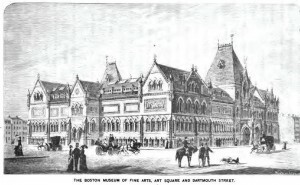 Original Boston Museum of Fine Arts Building on the corner of Dartmouth Street and St James Avenue. The new Back Bay neighborhood quickly developed into Boston’s premier arts and culture center. Copley Square (originally Art Square) housed the original Museum of Fine Arts and the original campus of the Massachusetts Institute of Technology (MIT). In 1895, construction of the Boston Public Library, the nation’s first branch library, was completed.